Become a AIM. sustaining member! 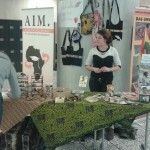 For a minimum fee of 40 Euro per year you can constantly support the work of AIM. as a member and contribute to a sustainable development. Our members are regularly informed about current projects and the construction progress of the training center via a newsletter. You are a student or collegian and the minimum fee is to expensive? But you still want to support us? For students and collegian our membership fee is only 2 EUR per month or 24,00 EUR per year. 1. You are interested in sustainable development collaboration and want to contribute to this? 2. You know the work of AIM. and our Youth Club and can identidy with their values? 3. You want to support the activities of AIM. with your membership? If you answered all questions with a YES, you are qualified to become a member of African Information Movement. As a patron you receive regularly updates of all activities from AIM.. If you wish to your name will be listed on our website. You will be invited as a guest to all important events from AIM. Once a year there is a patron meeting where you will be invited to, to receive a complete report about our success in the previous year. As a patron you are paying a yearly patron fee of GHȼ 120.00 to the bank account of AIM. Ghana to support our daily work. As a full member you will be invited once a year to a membership meeting to receive a full report about our activities. During this meeting you have the right to vote AIM. members for the managing board or even to be a candidate for the managing board yourself. So you can support the organisation with pathbreaking decisions. As a full member you are paying a yearly fee GHȼ 24.00 to the bank account of AIM. Ghana to support our daily work (monthly fee of GHȼ 2.00). You want to work honorary and support our NGO-work? At the moment we are looking for some support for our activities. All of our nonsalaried workers have a job, a family or are students. Every helping hand is warmly welcomed. You are interested and eager to start right now? Or you want to get more impressions in a meeting with someone from the managing board? You have a desire for honorary work? You are not only interested in a membership, donations or sponsoring, but want to contribute an important part of the development of the K.E.E.A. district and Ghana as a whole? Maybe you also have special skills and talents you want to share with the Youth? Or you are an expert in one of the following topics? You are willing to work for the sake of others? We would like to welcome you in our organisation. You won’t earn money helping us to achieve our goal, but you will experience life changing experiences. We are not only working, but also laughing and celebrating together. Feel free to contact us now and set up a personal meeting. We are happy about every helping hand. 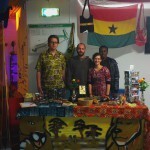 Our information booth gives not only information about our activities and projects in Germany and especially in Ghana – there is even more! 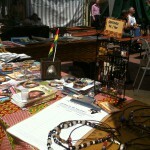 We sell Ghanaian jewellery like earrings, bracelets and necklaces, but also bags and beautiful postcards from Komenda, Ghanaians and different project activities. If you are organising an event and you have some place for our information booth, feel free to contact us. Promote our work, since all of the revenue will directly be used for our projects. 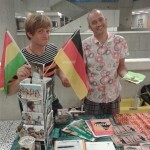 You are interested to tour with our info booth? Simply write us a mail. We are happy about everyone who wants to help.